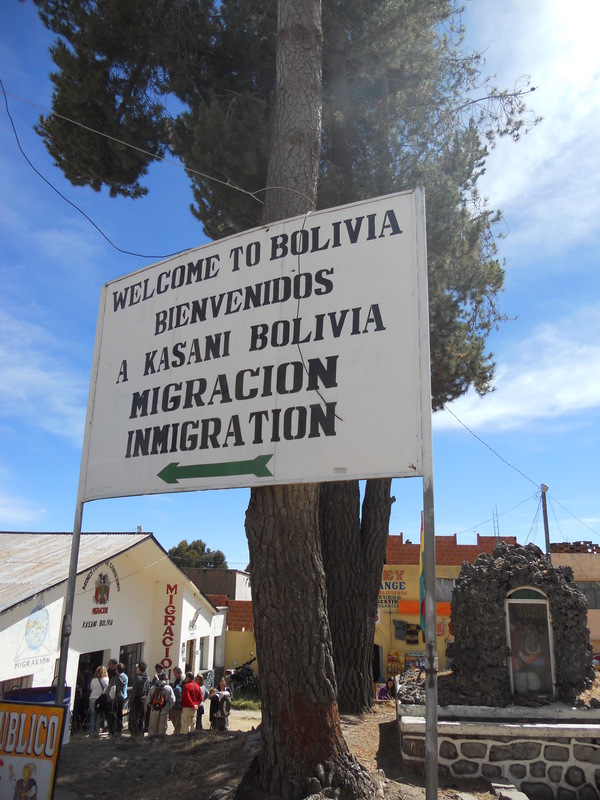 Border Crossing – The brick wall separating Peru & Bolivia. Peru was behind us as we walk into Bolivia. Recently my mum asked me a few questions about crossing land borders, as I’m up to my fourth border crossing on this South American tour. What happens? Is it safe? How do you do it? Is there anything separating one country from the next like a brick wall???? Noooo of course there’s not a brick wall that would be mental. 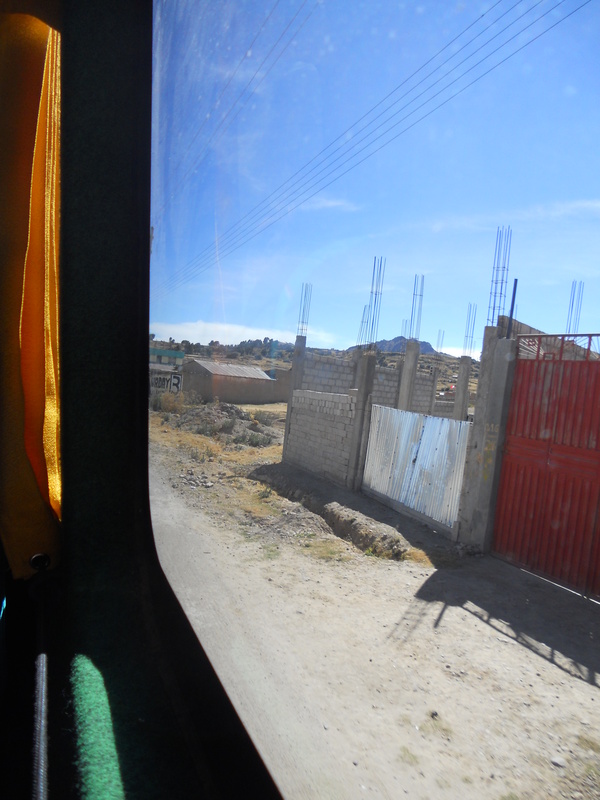 That was until I crossed from Peru (Puno) into Bolivia (Copacabana) and guess what… there was a brick wall!! 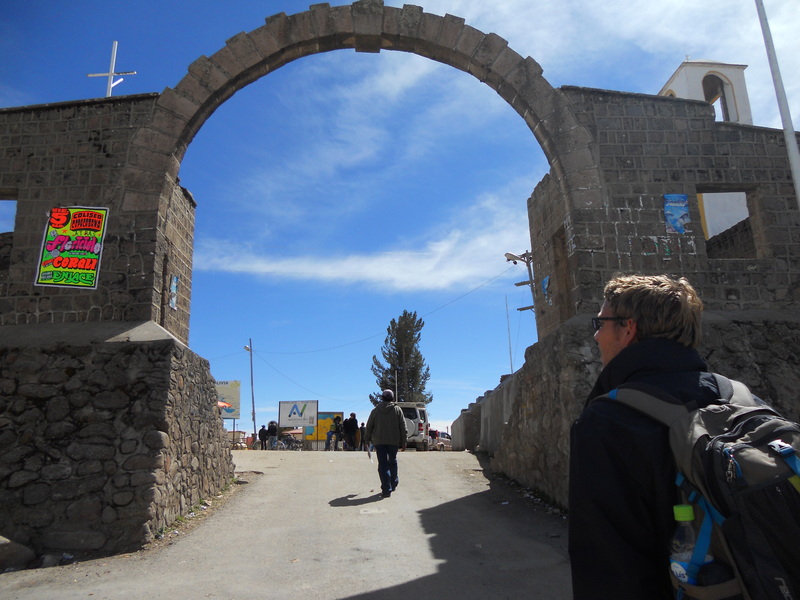 Well, it was a brick wall with an archway in the middle; you had to walk under the archway to go from Peru into Bolivia BUT there you go a brick wall!!! It got me thinking about all the land borders I’ve crossed travelling around South America. Border Crossing…the all important signs. Probably my worst border crossing experience was going from Venezuela (Maracaibo) into Colombia (Maico). We searched and searched for a bus company that went from Venezuela across the border into Colombia and there wasn’t one, well there used to be one but it wasn’t running anymore. We still got to the bus terminal at about 6am in the morning, hoping to stumble on a bus that could take us all the way to the border, but there wasn’t any. Although I have to say Venezuelan bus terminals are really difficult to navigate, they are crazy, pure chaos, rows and rows of bus, taxes, collectivos, people, shops, beggars EVERWHERE. All we could find was a taxi driver willing to drive us to the border and across into Colombia to the nearest town of Maico. This being our only option we had to do it. Both of us were a little scared as we’d had a horrible night in Maracaibo. Its was a really rough, enormous city, our hostel was like a fortress, so much barbed wire and broken glass, in fact every building we saw was like this…..not a safe city then. Plus the taxi was pretty shoddy, the boot didn’t close, no seatbelts (haha it makes me laugh that I even thought there would be). The driver looked like a total rip off merchant too; he drove off with us, changed the price straight away AND he wouldn’t stop to let us out to change drivers grrr. 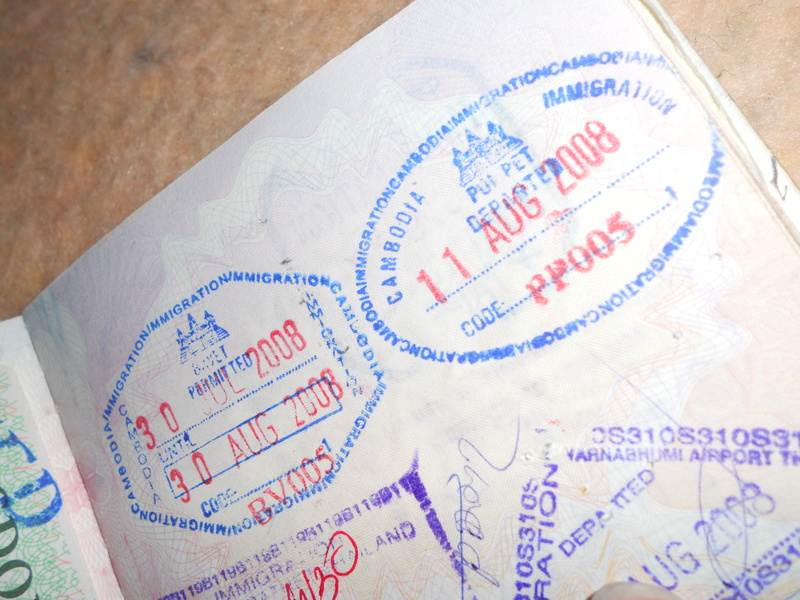 Passports at the ready! Soooo precious!!! The long trip to the border (a couple of hours drive) was through some really rough looking towns, half built, dirty, lots of stray dogs. There were also numerous check points along the way with lots of police checking the boot and checking our passports. 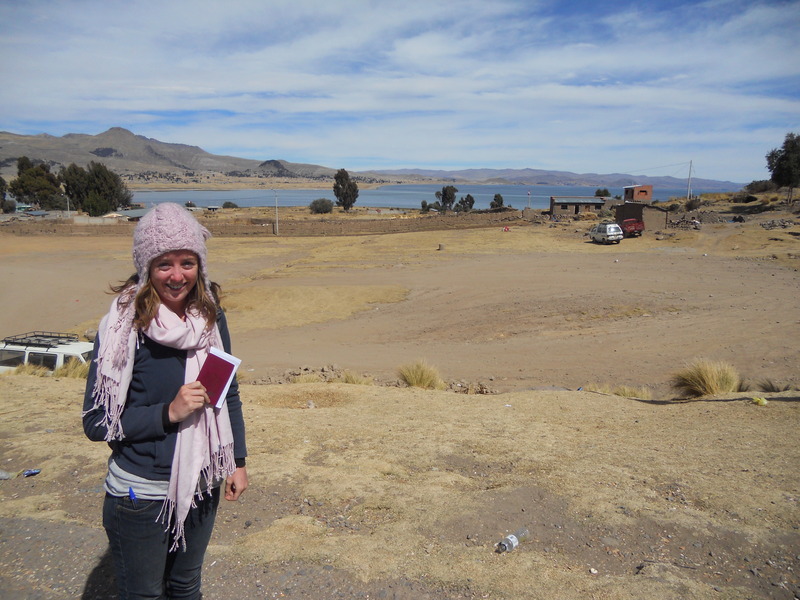 Now don’t worry, this story does end well, it’s 6 months later and I’m in Bolivia so I’m alive! It was just a stressful trip. 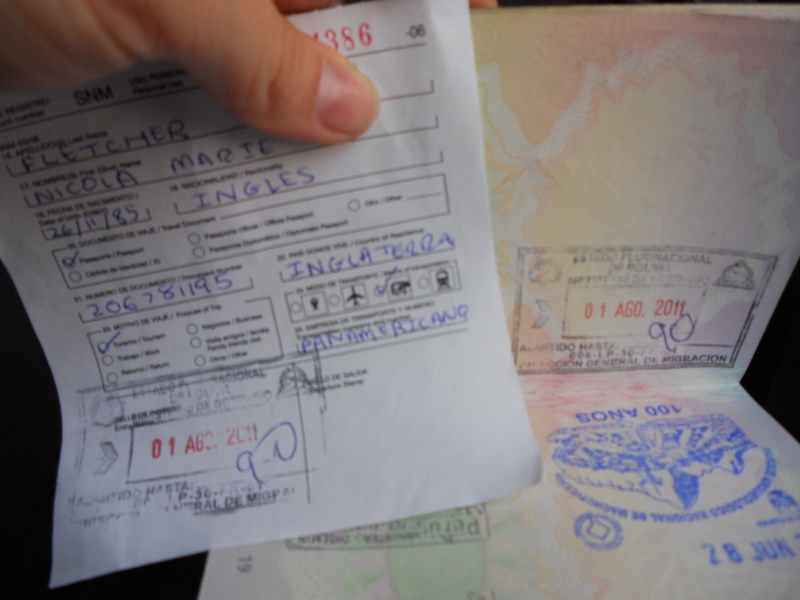 The taxi driver kept trying to take our passports and charge us random border crossing costs. 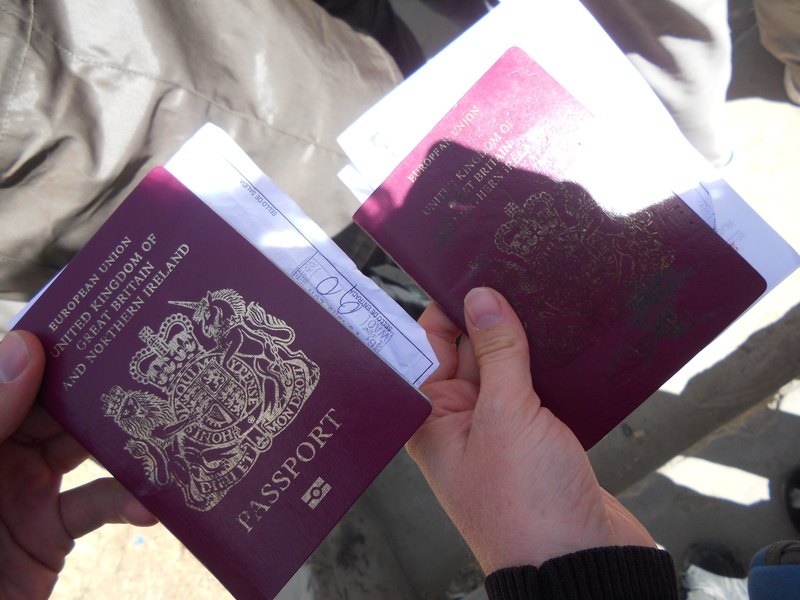 Luckily we are not naïve or STUPID so we never handed over our passports or paid him anything extra. 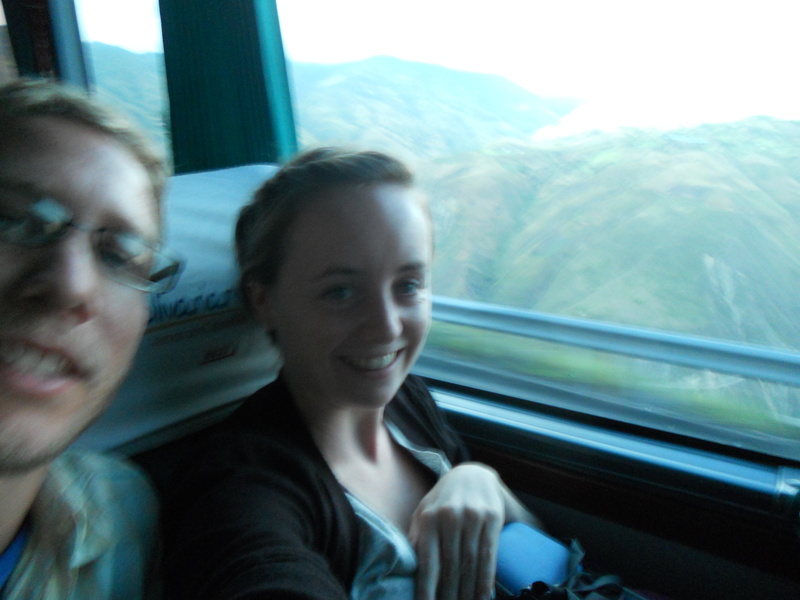 In fact the Colombian border guards were really friendly and assured us that there were no border charges to be paid. The taxi driver took us across the border and dropped us in the city of Maico as he promised. He tried to charge us more than we’d agreed but we didn’t pay it. Entering Peru you get this extra form which you must keep safe, if you lose it you get fined on your way out! All the other South American border crossings I’ve done have been much more straight forward as there has always been buses that take you from one country, across the border and into the next. 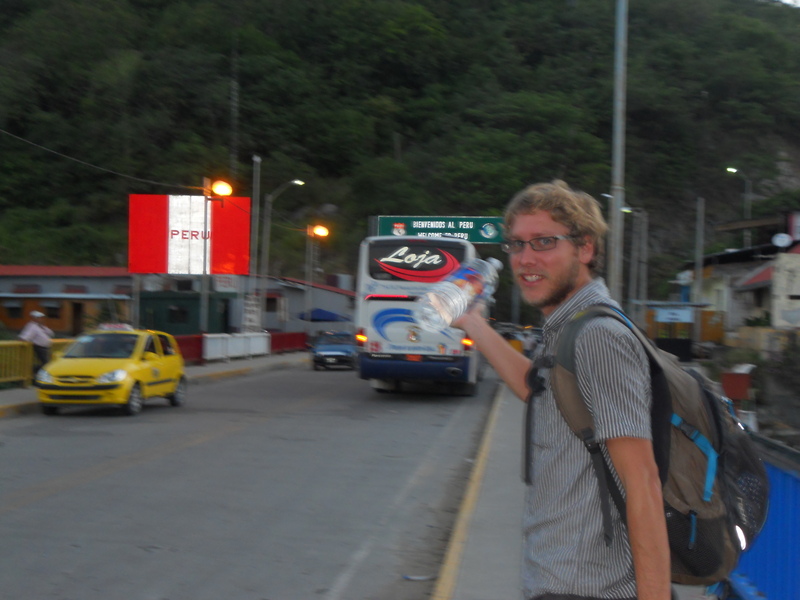 Border Crossing – The best are always when you can stay on a bus & go from one country into the next on it! Some border crossings seem more official than others. 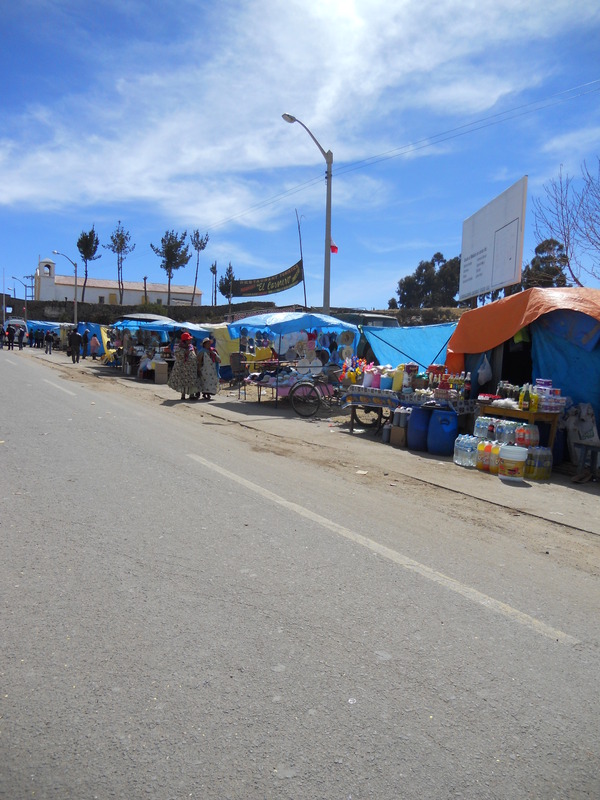 For example, when I crossed from Ecuador (Vilcabamba) into Peru (Piura) on the Ecuadorian side the guards were dressed in really smart military uniforms, they were very serious and their office was fancy. But on the Peruvian side (about 10m away) it was just a dirty office, with a man wearing jeans and a t-shirt and there was a poster of a naked woman on the wall! 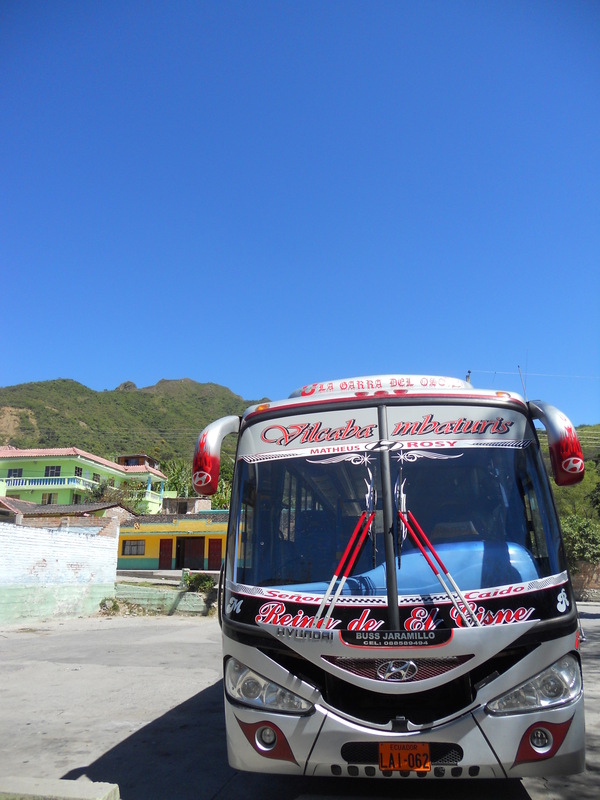 The bus that took us from Ecuador (Vilcabamba) to Peru (Piura). There has never been anything major separating the two countries I’ve crossed between. Going from Ecuador into Peru I had to walk across a bridge, so that was funny, the river did separate the two countries. Normally both sides seem quite similar. Walking from Ecuador across a bridge into Peru. The bus goes ahead but you have to jump off & walk across. What I’ve learnt is that all borders are dirty, they really seem like no man’s land and there are always tons of sellers lining the road sides. Also if you have to stay in a border town they are usually really bad with absolutely nothing to see. 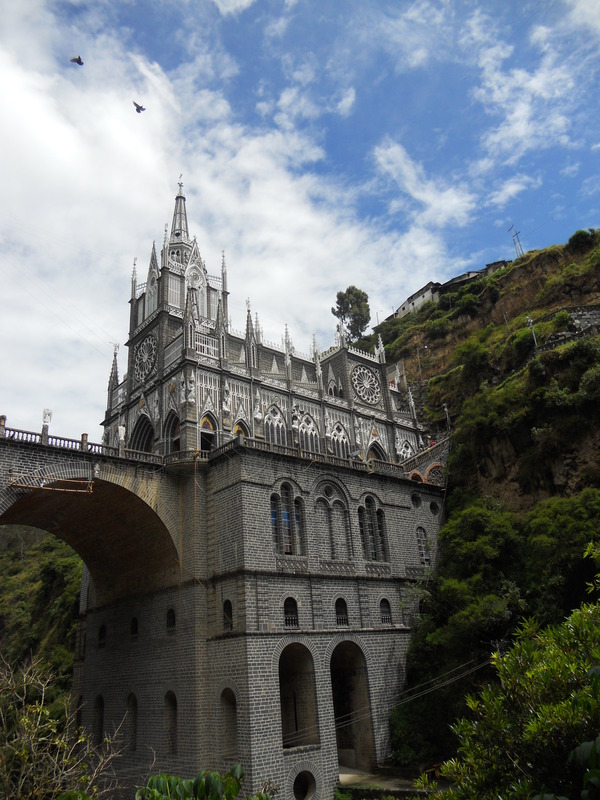 The one exception being Ipiales in Colombia, a nothing town, but on the outskirts you can visit the spectacular Las Lajas Cathedral. Colombia – Ipiales – Las Lajas Cathedral in the Colombia/Ecuador border town. There has only been one border crossing where my bags and bus got checked a lot. That happened in Ecuador after crossing from Colombia (Ipiales). The bus got stopped numerous times along the road to Quito, bags were pulled out, passengers were pulled off, and sometimes the passengers didn’t even get back on the bus, who knows what they found in their bags! YAWN another border crossing bus journey, always a long day! You always have to do a little bit of walking across the border even if you are on a bus that will take you from one country into the other. I find this part quite fun (that’s a little bizarre I know). 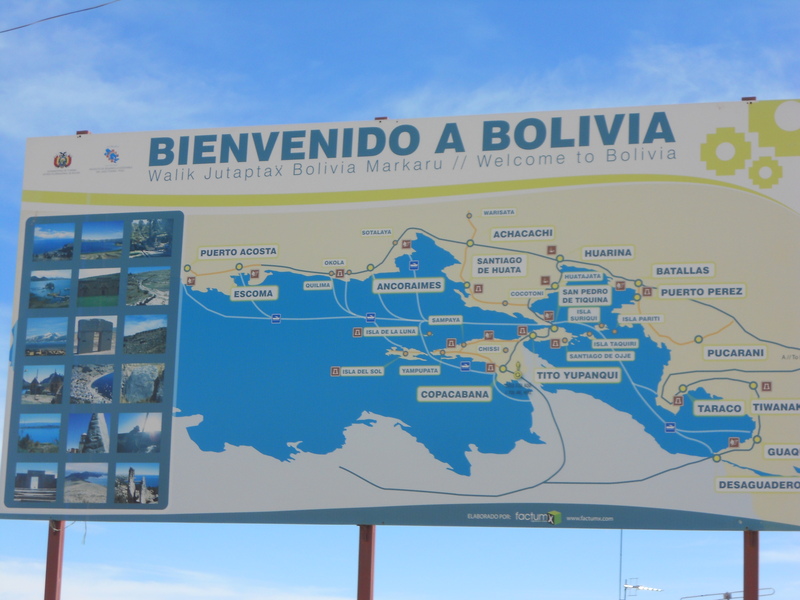 Walking from Peru into Bolivia right next to LAKE TITICACA!!! Thanks for visiting….Colombia….see you soon! 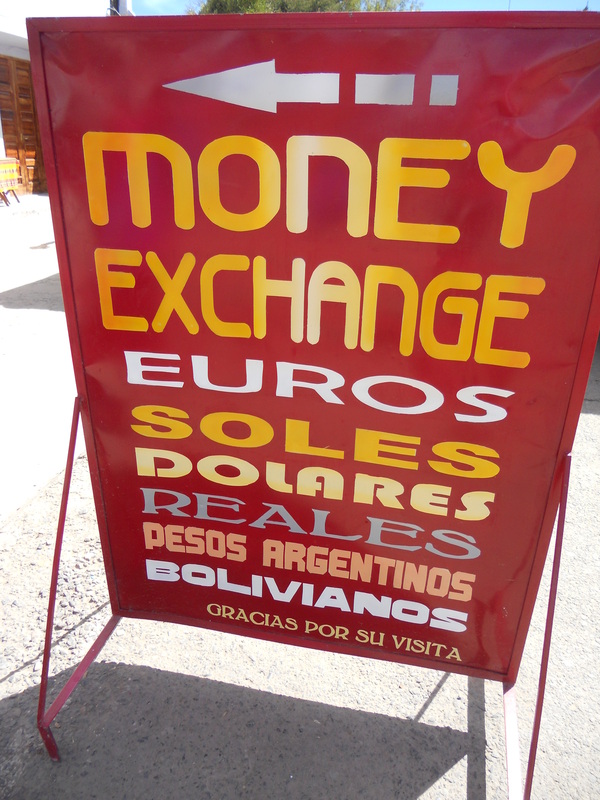 Getting people shouting at you DOLLARES, DOLLARES, EUROS….never pounds! Looking at all the crazy sellers, checking out what they have to sell. It’s always really bizarre items that you are probably not going to buy on your 5min walk across the border. Change my money here? Are you mental?! Border crossing sellers. They line the whole route from one country into the next AND they all sell exactly the same things! 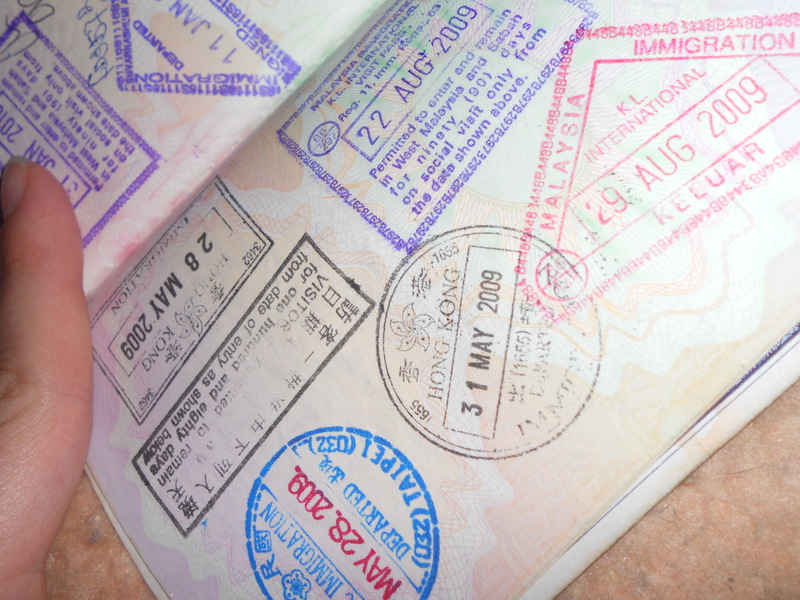 The best part for me is getting your passport stamped. I always get a little bit nervous in the queue. Will they let me out? Will they ask me any questions? This is stupid I know, I’m ENGLISH so I can safely go between many countries without any hassle and I’m usually given a large amount of days to stay. 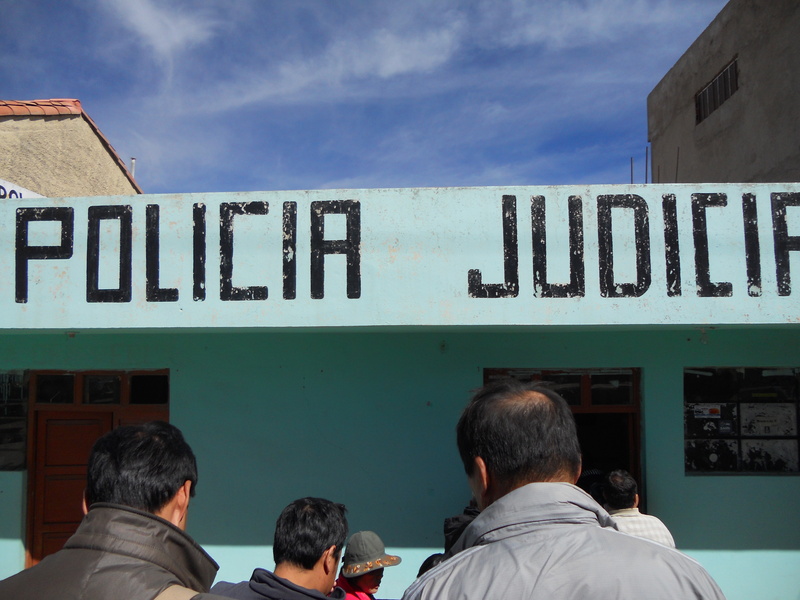 Queuing to get stamped OUT of Peru…will they let me out?? 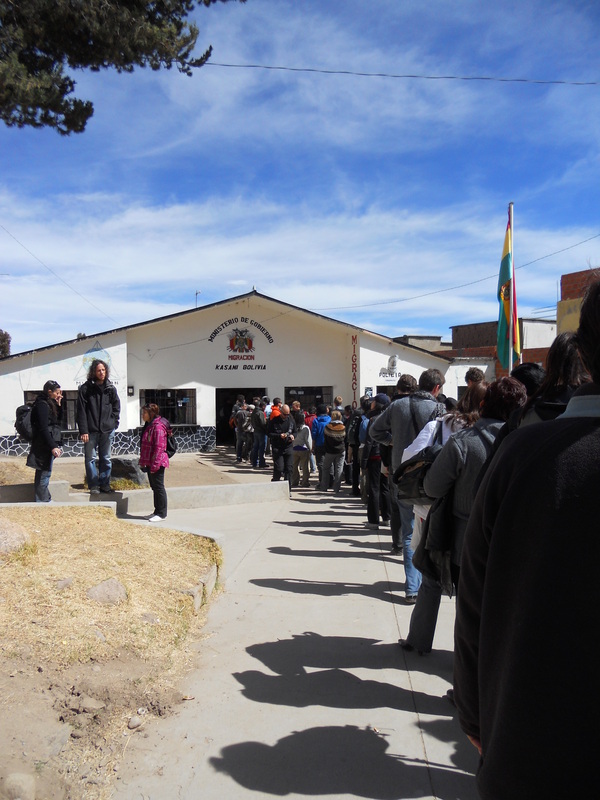 Queuing to get stamped INTO Bolivia. This queue went pretty quickly BUT the queue to get into Ecuador took us 3 HOURS!!! So far in South America the stamps have been incredibly boring, not what you want in your travelling passport. 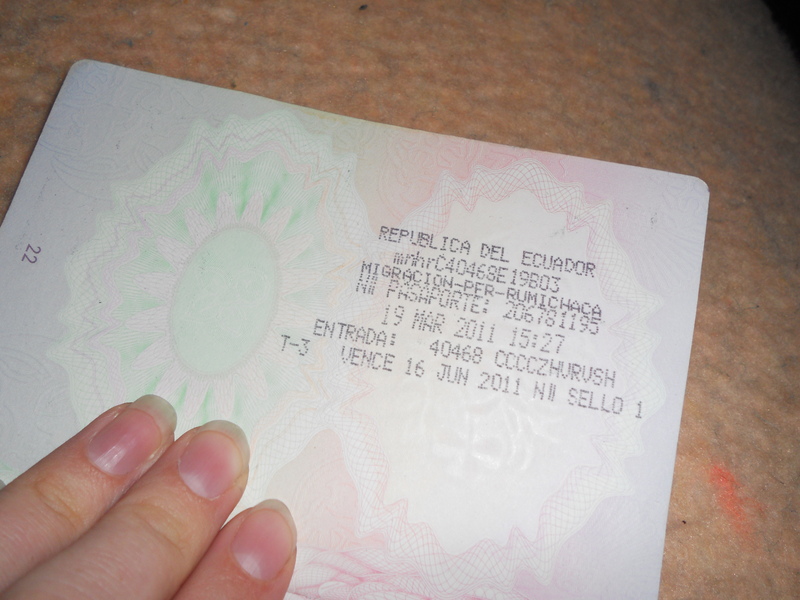 Ecuador was the worst, it wasn’t even a stamp, your passport got put into a machine to be printed on YAWN. South-East Asia was so much better for giving you interesting stamps. They were colourful, came in different shapes and sizes and there were often little pictures on them. For example, Hong Kong’s stamp has their national flower on it and Cambodia has a small Ankor Wat on it. Ankor Wat on Cambodia’s stamp. Did Peru’s stamp have Machu Picchu on it…..NO! Although on a side note at Machu Picchu you can get a stamp of it in your passport, which of course I did. 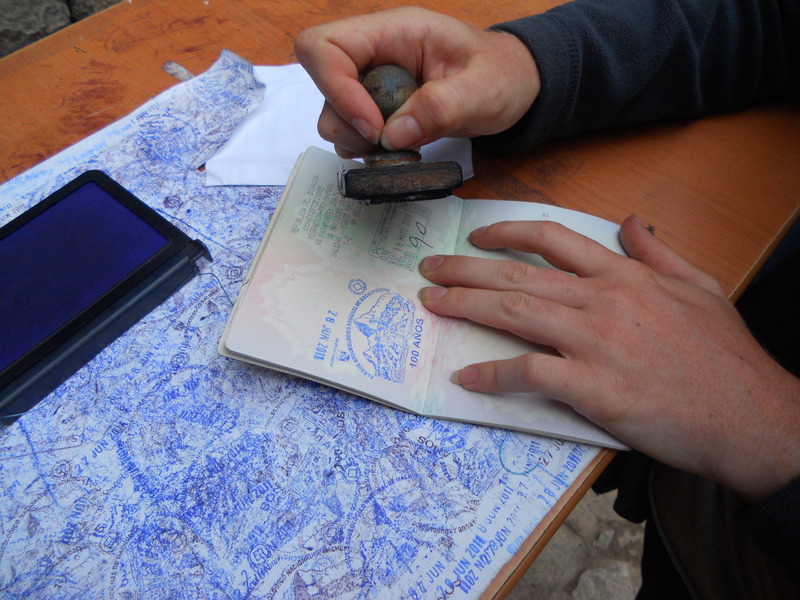 A passport stamp at Machu Picchu!!! I’ve got a few more land border crossings to do in South America before I get back onto a plane…I wonder what they might bring hopefully some interesting stamps! Or if you’ve got some South-East Asian travel plans, take a look at My Travels…Asia. 84, 83 Days…A Definite PuNO! Liked this. As Tom told you about our crossing from West into East Germany – guess all he will remember was me having to salute the Russian soldier as he was only 6 years old. That was an experience.